Virginia Satir was named by "Psychology Today" as one of the ten most influential therapists of the twentieth century. She was a charming, charismatic teacher, writer, theorist and workshop leader, and a leading pioneer in the field of family therapy. Often, when a charismatic therapist dies, her teachings die with her. 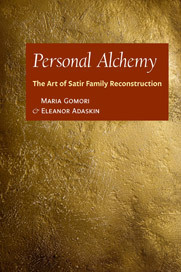 Thanks to Maria Gomori and others, Virginia Satir's teachings and methods for healing broken and wounded families have been kept alive, in an incredible way, through the establishment of 26 Satir Institutes around the world.